Extreme price volatility can create headaches for food manufacturers. In 2016 alone, the price of Class III cheese rose from just under $13 per hundred weight in May to nearly $17 only three months later. In 2018, however, prices were consistently lower month over month than in 2017. Relief for farmers is expected in the second half of 2019, however, and you can almost hear their collective sigh. While that’s a hopeful sign for those in the dairy industry, price volatility continues to be a challenge for food manufacturers that rely on dairy ingredients in their formulations. As dairy prices continue to demonstrate major fluctuations, the pressure is on manufacturers to produce the same high-quality products while keeping prices somewhat stable. As a result, many food manufacturers are looking for ingredient solutions that will reduce costs and mitigate the ebbs and flows of a volatile market without sacrificing the quality their consumers have come to expect. The chart above demonstrates the extreme price fluctuations of Class III milk, according to the USDA and, as you can see, markets have experienced significant volatility since 2015. As mentioned, lows reached below $13 per hundredweight in May 2016, then shot up to near record highs only a few months later. Finding quality alternative ingredients to mitigate the ever-changing price tag of fresh dairy products will continue to be a priority of food manufacturers. However, many of those same manufacturers still want to promote the many health benefits that real dairy has to offer. Manufacturers that want to list real dairy on their labels and feel good knowing they’re still supporting family farms, ethical sourcing and sustainable practices, can use whey protein ingredients as an alternative. For example, Grande Bravo® functional whey proteins are real dairy products that are a result of the cheese-making process. These innovative whey protein ingredients help food manufacturers manage or reduce ingredient costs by limiting the need for volatile and perishable dairy ingredients such as fresh cream, butter and NFDM in formulations, all while maintaining the product’s creamy mouthfeel. While other dairy ingredient prices might fluctuate, Grande Bravo’s price point remains stable, regardless of market conditions for other ingredients. This price stability allows manufacturers to use the same recipe and consistent formulation, without having to worry about reformulating due to rising ingredient costs. Of course, while it’s nice to have consistent pricing and feel good about where your ingredients come from, the most important factor in choosing alternative ingredients is making sure they don’t negatively impact flavor and that they maintain or improve the consistency of your tried-and-true formulation. 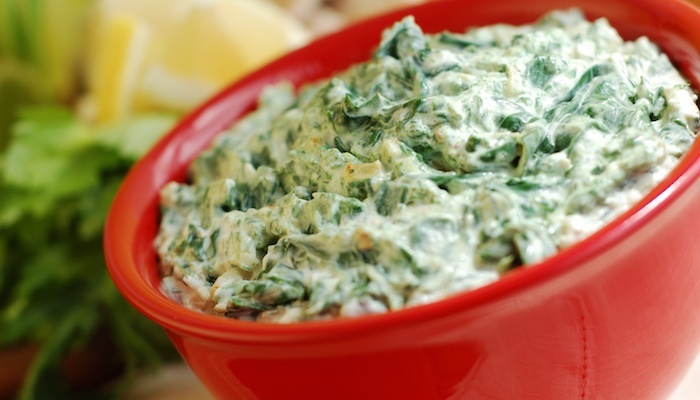 In a spinach and artichoke dip, we replaced some of the formulation’s high-cost dairy ingredients with Grande Bravo. Looking for a solution to help combat the increasingly volatile prices of dairy ingredients, Grande Custom Ingredients Group proposed that the manufacturer use a formula of 10% Grande Bravo 500 and water to replace 50% of the sour cream, mayonnaise and cream cheese used in the formulation. The modification to the formulation resulted in significant overall savings in dairy ingredient costs. Equally important, the dip’s rich, creamy mouthfeel was maintained. In addition, the new formulation resulted in 50% less fat and 23% fewer calories compared to the original formulation. The functionality of Grande Bravo is not the result of any chemical modification of the whey protein concentrate, a major consideration in light of today’s emphasis on clean labels and strict chains of custody. Grande Bravo is produced in a proprietary process and is a real, Grade A dairy product, allowing for manufacturers to claim it as an all-natural ingredient. In addition to creamy applications like soups, sauces, dressings, dips and spreads, Grande Bravo can also be used in bakery and confectionery as well as frozen desserts, processed meats, and coatings and seasonings. Let us help you tackle your formulation challenge, and feel good knowing you’re still using real dairy. CLICK HERE to get your free copy of our Cost Savings Guide for Food Manufacturers to find out how you can reduce ingredient costs and improve your formulations with innovative, dairy-based whey protein ingredients.